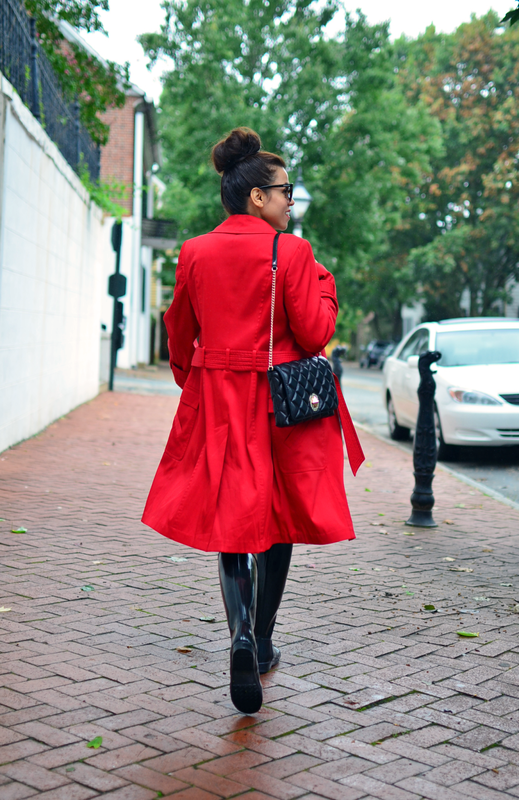 Khaki and black trench coats are very popular, but you don't see too many people investing in a bright colored trench like this red one and maybe it's because we fear opting for a color that will not be versatile. When I bought this trench coat almost a decade ago I had the same doubts, however, soon enough after I purchased it I was surprised by its versatility. Here, it's 10 years later and I still believe this coat is a stylish and fashionable piece. This vibrant red color cheers me up and brings fun to my outfits on windy or rainy days like today. Las gabardinas caqui y negras son muy populares, pero no se mira mucha gente invirtiendo en un color vivo como este rojo y probablemente es porque tenemos miedo en optar por un color difícil de combinar. Yo compré esta gabardina hace casi una década y tenia las mismas dudas antes de comprarlo, pero sorprendentemente resulto ser un atuendo muy versátil. Aquí ya son 10 años más tarde y todavía creo que es una pieza con mucho estilo y a la moda. El color rojo vibrante me anima y también le da un toque divertido a mis trajes en días con viento y lluvia como hoy. I love to mix fun pieces…can you tell? Me encanta combinar piezas divertidas…lo notas? Trench coat/Gabardina: Alvin Valley . Similar here and here. Bag/Bolso: Kate Spade. Similar here. WOW Carelia you look really good in your Trench and I like your new glossy Wellingtons, I've just bought a pair of glossy Violet Huntress Wellingtons and get many smiles when I wear them in town. Thanks Julia! I bet yours are awesome.